Fort Lauderdale is now known more as the yachting capital of the world rather than the Spring Break party scene it was in the eighties. International ships and yachts are built, repaired and stored here for the winter. However, there is still plenty of partying in the pubs, nightclubs and beach scenes. Two of Florida's best museums are here: the Museum of Science and Industry and Fort Lauderdale's Museum of Art, which houses paintings and prints by Picasso, Dali, Warhol and more. Riverwalk: Take a beautiful walk along the New River from the Art Museum to the Museum of Science & Industry. Las Olas Riverfront Cruises (954 463-3372) run past Millionaires Row and Port Everglades. Hugh Taylor Birch State Recreation Area: A freshwater lagoon with endangered plant and animal species in which to fish, picnic, hike, bike or canoe for a small fee. An unusual tourist attraction lies nine miles west of Fort Lauderdale in the city of Sunrise: The Sawgrass Mills Factory Outlet Mall, the largest factory outlet mall in the United States. Millions of people visit this 2.3 million square foot, two mile long mall where brand name stores sell items for up to 80% off retail prices. 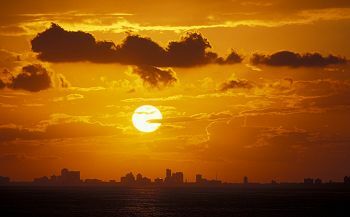 For more information, contact the Greater Fort Lauderdale Convention & Visitor's Bureau at (800) 227-8669 or www.sunny.org. The City of Fort Lauderdale also has a website at www.info.ci.ftlaud.fl.us.